During this time of Winter Solstice as the amount of light we receive lengthens, we gather with the Lightbearer in mind. What is the Lightbearer to you? Who or what brings the light for you? Although not always seen, the light is always there. Let’s explore the ever present light using SoulCollage®. SoulCollage® is an intuitive collage process for self-discovery and community developed by Seena B Frost. 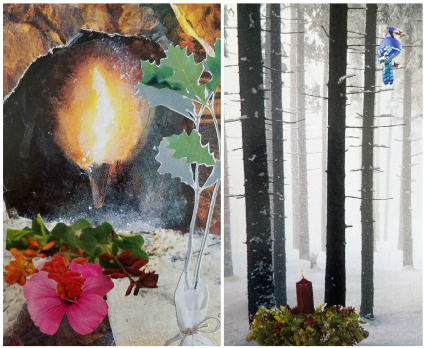 Tapping into the transformative power of imagination and intuition you will create personal collaged cards from images. The goal is to discover the unique inner and outer guides and challengers of your individual Souls, while in an environment that supports creativity and is safe for each person to explore and express his or her own unique soul in its lightness and shadow. Josephine Banks, aka, Miss Begotten is a self-taught artist, writer, gardener, Domestic Goddess and SoulCollage® Facilitator living in Vancouver, WA. 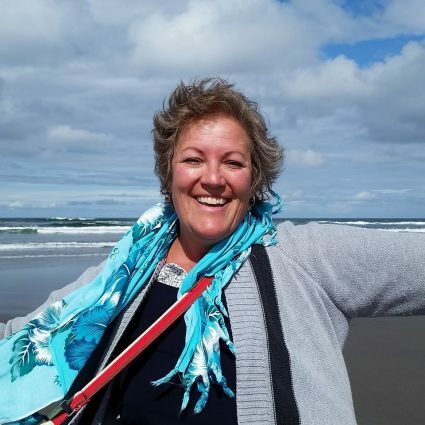 The beautiful Pacific Northwest and frequenting the Long Beach Peninsula as often as possible keeps her spirit alive, fresh and growing on a daily basis. Miss Begotten is currently sharing her art at The Bay Avenue Gallery in Ocean Park, WA. Using SoulCollage® I have found that pulling up bits and pieces of myself that have been locked away is a beautiful process. I find it enriching and healing to my life and that of others. BRING: All supplies provided in addition to lunch; I will be sharing a pot of soup and some lovely bread. Please feel free to bring any snack you may need for the duration. Coffee, tea and water provided. This workshop is for students age 16 years old and up. 12 students max.